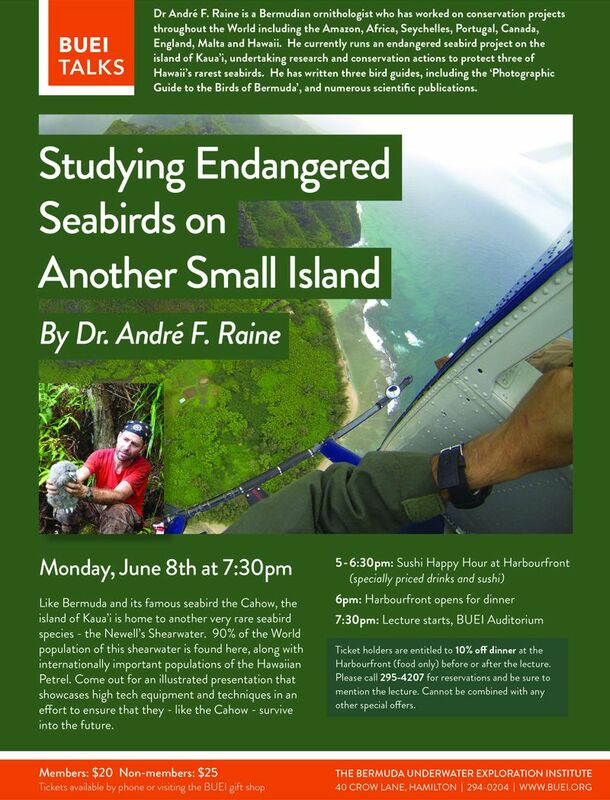 Bermudian ornithologist Dr. André F. Raine is currently running an endangered seabird project on the island of Kaua’i, undertaking research and conservation actions to protect three of Hawaii’s rarest seabirds, with an upcoming entry in the BUEI Talks series to focus on his work. Dr. Raine has worked on conservation projects throughout the world, including the Amazon, Africa, Seychelles, Portugal, Canada, England, Malta, and Hawaii. He has written three bird guides, including the Photographic Guide to the Birds of Bermuda, and numerous scientific publications. The event poster says, “Like Bermuda and its famous seabird the Cahow, the island of Kaua’i is home to another very rare seabird species – the Newell’s Shearwater. “Come out for an illustrated presentation that showcases high tech equipment and techniques in an effort to ensure that they – like the Cahow – survive into the future. The presentation will get underway on Monday, June 8 at 7.30pm, with a Sushi Happy Hour to be held at Harbourfront from 5.00pm to 6.30pm, with dinner opening at 6.00pm.